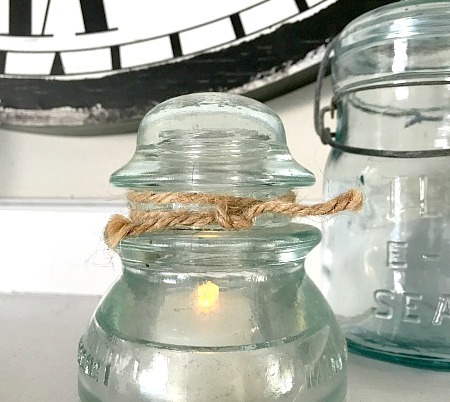 As an alternative to a red and green holiday season, I turned my mantel into a winter wonderland using my favorite decorations and my Mason Jar Collection. If you missed it you can read all about it [here]. I'm including my Amazon affiliate links in blue so you can find the products I use to get the look at home. 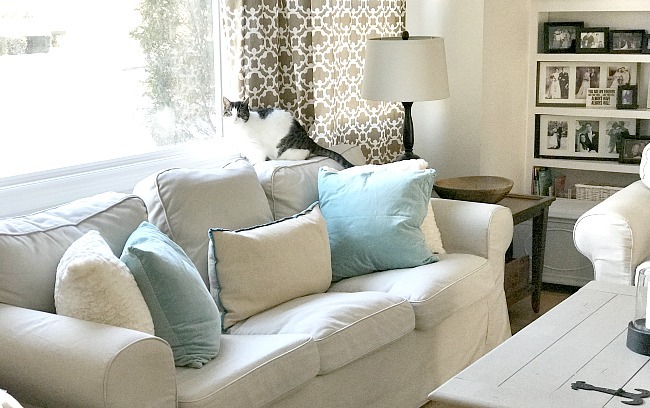 The next step was to decorate the room with that pretty Mason Jar blue color by adding teal blue pillows and throws. 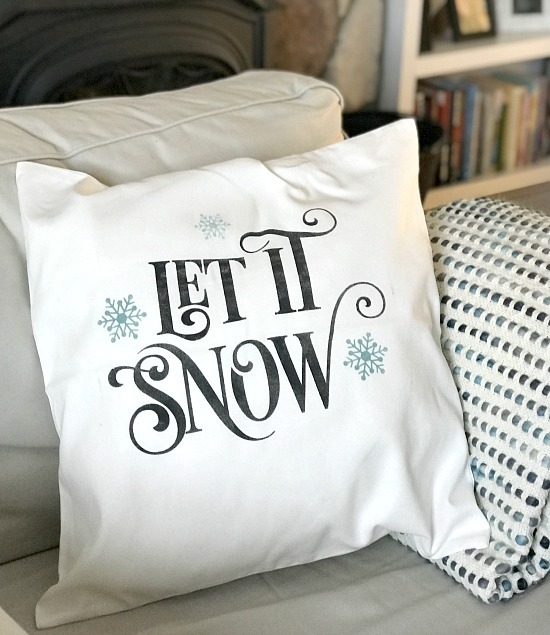 I used my Silhouette machine to cut winter themed vinyl stencils to add decorative pillow covers. 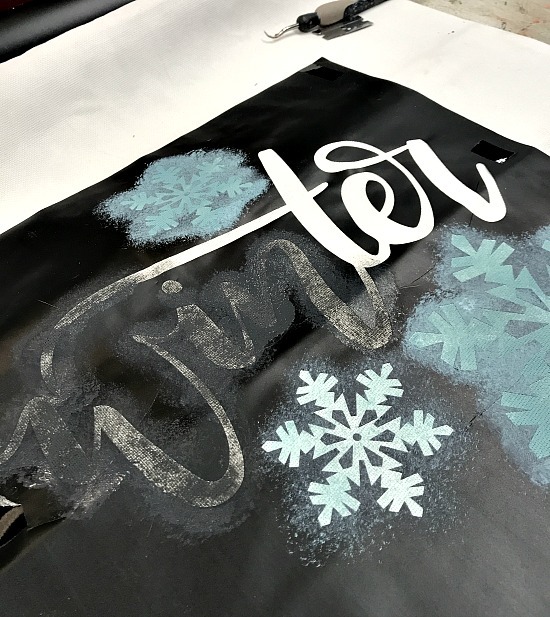 The winter themed cut files can be found at the online Silhouette store. 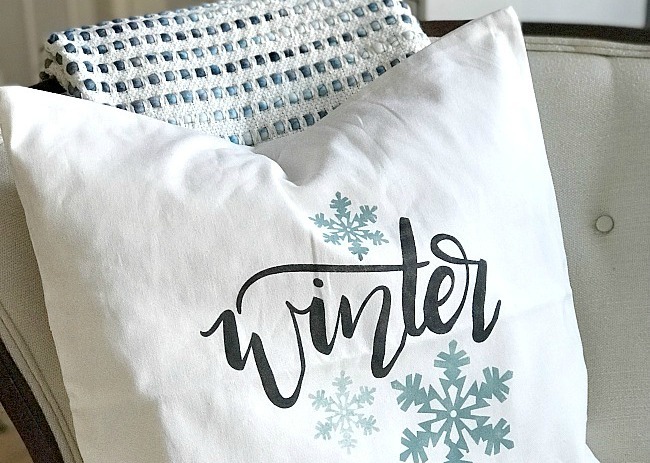 I used a black and a teal blue chalky paint to stencil the design onto a blank pillow cover. Before I started painting I put a piece of parchment paper between the pillow layers so it wouldn't leak through. I used a stencil brush and off-loaded the paint onto a scrap piece of wood so the brush wouldn't hold too much paint and leak under the vinyl. I gently pounced the color inside the stencil. 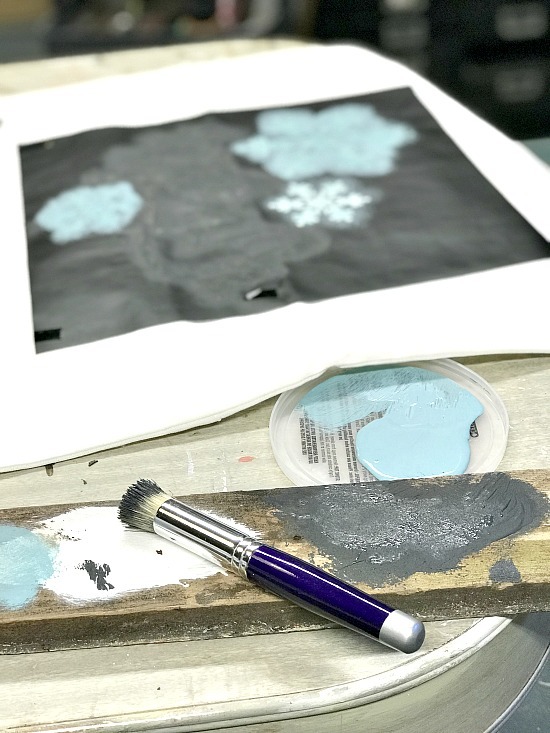 I created a lighter blue snowflake by using less paint. When the paint was dry I peeled off the stencils and removed the parchment paper. 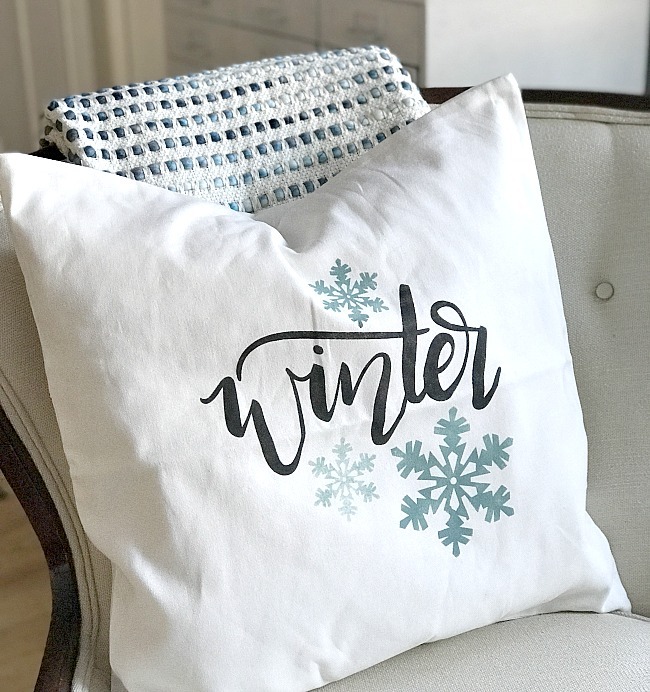 The color is perfect and they look great in my winter themed living room! while in it, I'm going to rock it! Still have it on my 2018 resolutions to learn how to use my silhouette! Love the pillows and your color choices. Thank you Carlene! It is not as hard as you might think. If you can figure out the blog and tailwind, etc then you can figure out the Silhouette! My resolution is to actually buy a machine. I'm stuck between the two options and can't decide if silhouette is the best choice? Have you any advice for us "stuck on the fence" gals? 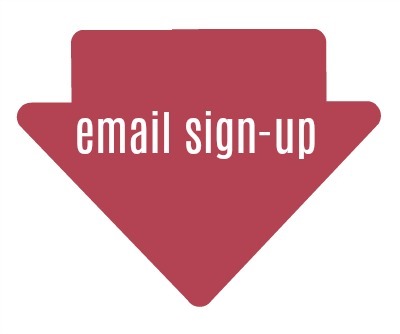 Perhaps a post somewhere on your blog I can read? Any help in making the decision towards Silhouette or the other would be appreciated. I'm with At Rivercrest Cottage. I want a Silhouette or a Cricut, but can't decide. Do you get access to some files to use with each or do you have to purchase every file to use? 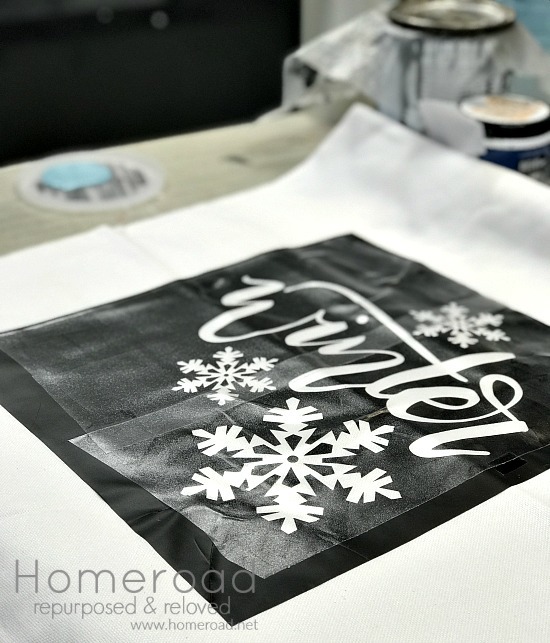 I'd love to hear more about how you print the file and how you take out the inside to make a stencil. Is it labor-intensive. Or very easy to do? Hi Bonnie! I do not know which is easier ( see my comment to Rivercrest ^^^) There are many free files available but if you buy them they are not expensive. You can download files which are about $1 each (50 cents when on sale) and you keep that file forever. You download the software onto your computer then print your design onto vinyl that you send through the Silhouette Machine. Taking out the inside of the vinyl is called weeding. 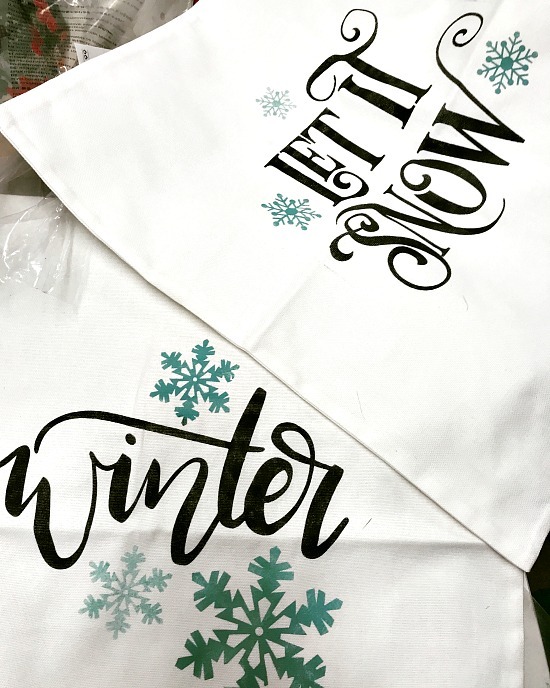 You just pull it off the backing then use a transfer paper to transfer the vinyl to your project so the middle of the letters stays with the word. It takes a while to get used to but there are many videos to help you learn it. 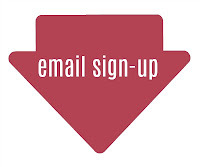 Look on Youtube for tutorials that will show you how. Hope that helps! Good luck! Cute pillow! Need to get a vinyl cutter - someday - to easily make such cute things. Visiting from Vintage Charm.